Database size - cloud storage occupied by database: tasks, emails, CRM information (without files). Disk space used - files stored (located) at your account. Free space - amount of free available space. Storage space is provided per account & cannot be distributed between account users by administrator. The storage space is loaded automatically & simultaneously taking into account all account users workload. Emails & email attachments. You can run out of free storage because of the large number of emails & email attachments, that you work with in the CRM. To reduce the amount of storage space used you should delete old emails. All email attachments can be found under Company > Company Drive > Email Attachments. After deleting files form this folder, don’t forget to empty the recycle bin as well. My Drive files. Files uploaded to My Drive are counted in the storage space as well. Don't forget to check iMessenger, Uploaded & Created Files folders for files uploaded to messenger, Activity Stream posts or created from scratch. Company Drive files. Users of your Bitrix24 account can upload files to the shared document library - that is Company Drive. You need to check these files as well. Don't forget the Recycle Bin. Other users My Drive. Each Bitrix24 users has own My Drive with own files. Bitrix24 account administrator can open each user Profile Page > Drive to check the amount of space used by each user's files. Don't forget to check users Recycle Bins. Workgroups Drives. Each workgroup has own Drive section where files can be uploaded by workgroup members. Don't forget to check & clear the Recycle Bin. If you’ve deleted unnecessary files, emails, etc. please note, that the actual cloud storage space information will be updated in 24hrs. 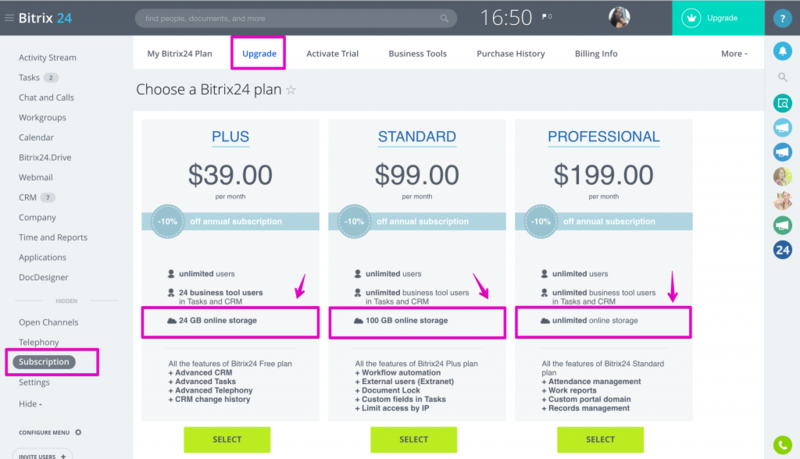 You can check your storage space information later under Subscription > My Bitrix24 Plan. In case you stop paying for Bitrix24 CRM+, Standard or Professional plan, your data (stored in Bitrix24) won't be lost. But, if the amount of storage space exceeds the limit allowed by free plan (5Gb) - you won't be able to perform actions inside your Bitrix24. 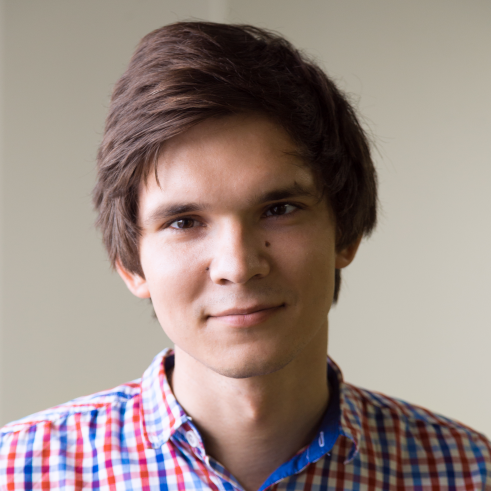 For example, edit files, upload new ones, send messages, set tasks, etc. You will need to either delete files, tasks, messages & other data stored in your account or renew the subscription. *Important:The PLUS subscription option was available to Bitrix24 users from January 10, 2016 to March 18, 2019. This subscription option was archived and is no longer available for new Bitrix24 users, meaning that Bitrix24 Cloud accounts created after March 18, 2019, that had never been activated with a commercial subscription, cannot be upgraded to the PLUS subscription. Upgrades or downgrades from other commercial options to the PLUS subscription also become unavailable after March 18, 2019. 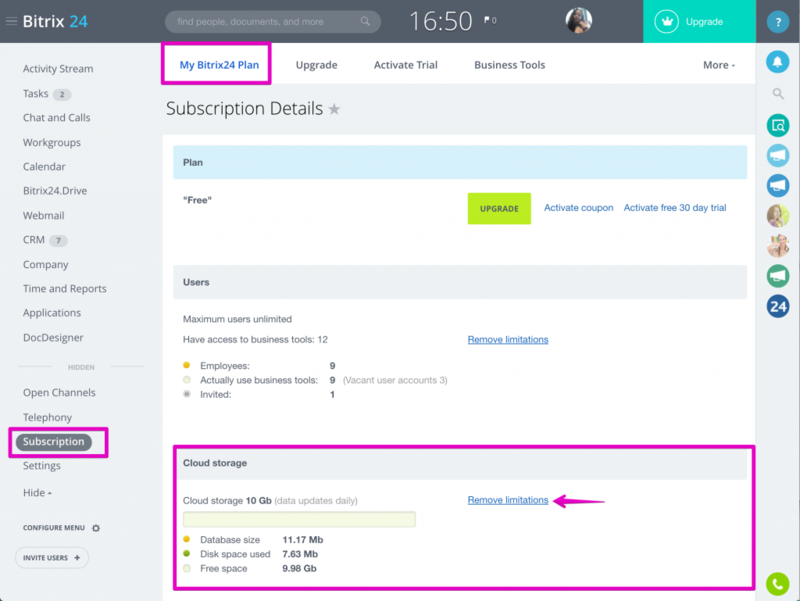 If your Bitrix24 Cloud account had been created before March 18, 2019, and you are currently using your account with the PLUS subscription option, you can continue renewing your PLUS subscription unless you decide to upgrade or downgrade your account to another available subscription option, or unless your Bitrix24 Cloud account gets rolled back to the FREE subscription option due to non-payment.